A genuine 7mm white akoya pearl solitaire ring set in .925 sterling silver. The center akoya pearl is a "A" rated and set in real silver. The band measures 2.5mm wide and is available in sizes 4.5 - 9 for women. Also available in 14k white, yellow, or rose gold (pictured below). Since our akoya solitaire ring is individually made to order, please allow for 7-10 business days prior to shipping. You won't regret the wait! 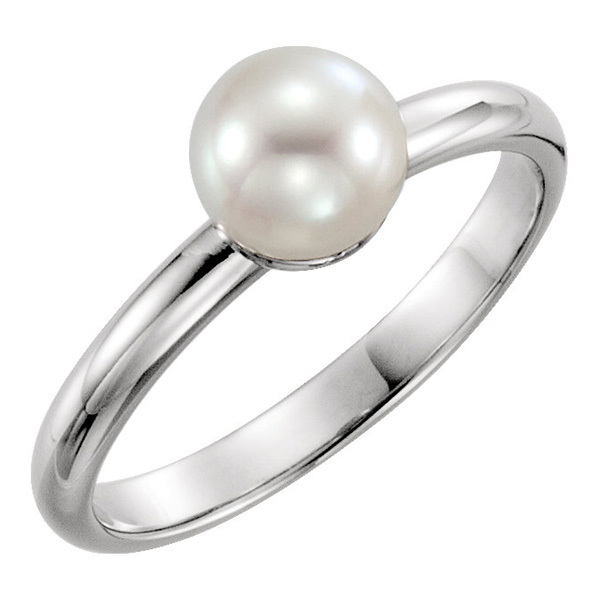 It's a genuine pearl ring that will add beauty to any silver and pearl jewelry collection! We guarantee our White Akoya Pearl Solitaire Ring in Sterling Silver to be high quality, authentic jewelry, as described above.